An diet drink after a heavy meal from pongal celebration. It is one of the recipe, prepared in many homes for morning breakfast. I was introduced to this after my marriage through my MIL. She makes these almost every morning for BF. 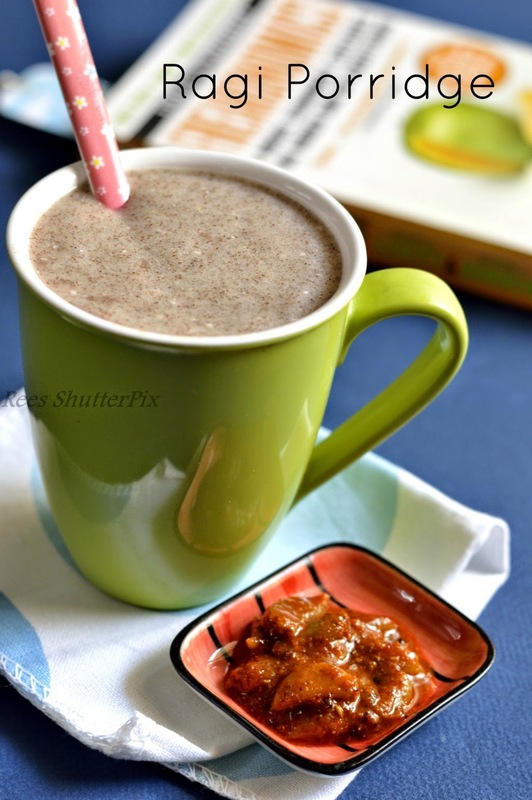 But we never get a chance to taste this as she prepares varieties of tiffen when we visit home, during one long stay at home, I forced her to make this simple, healthy and delicious drink. After which, I loved to make in our home very often. Just ragi and curd to fill your tummy happy for hours!!! The sour curd with ragi and a dash of pickled garlic is so divine!!! You should never add ragi flour directly to boiling water. It forms lumps. You should ensure ragi is cooked properly by checking the time, taste and shine. Another trick to check if ragi is cooked or not, which was shared by my relative, dip a spoon in hot water and then dip in cooking ragi, if ragi doesn't stick to the spoon, it is cooked else it is not cooked. You should never consume half cooked ragi. To make it more flavorful, you can garnish with tempered mustard, small onions, green chilies, and curry leaves. 1. Prepare the ragi paste: Take ragi powder in a mixing bowl, add water and mix well to form a paste. Best to mix with hands to avoid forming lumps. It should be clear and free from lumps. Boil water in a pan, once it comes to bubbling boil, add the ragi paste slowly while stirring continuously with a spoon. 2. Now, keep stirring the ragi to avoid forming lumps. Check the consistency of ragi in the picture. 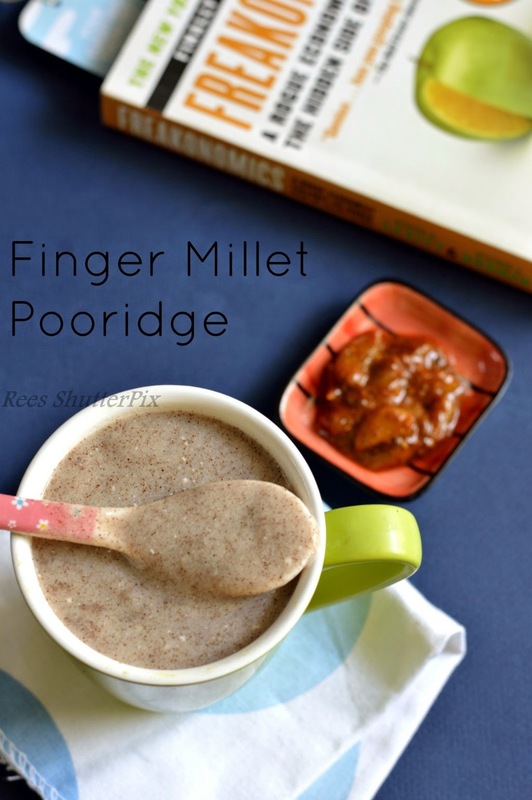 Once the ragi is cooked, it will add an shine to the ragi and also you can check for the porridge consistency. It takes around 10-15 minutes in medium heat. Remove and let it cool. You must keep stirring to cool so it doesnot form lumps or layers. Once its completely cooled, add curd and salt. Beat and mix well. Serve! Serve with pickle, mormillagai, pappad's, and vathals like sunddakai, neem leaves. Healthy and filling drink.. Perfect for breakfast. Am sure this would have tasted awesome!!! Splendid porridge to cleanse our body and to give a break from all those things we have stuffed ourselves with.